The story behind the existence of Darksiders 3 might be the most interesting thing about it. After the release of the excellent Darksiders 2 in 2012, circumstances outside of then-developers Vigil Games' control made it seem unlikely we would ever get a continuation of the intriguing apocalyptic storyline. In the year following the game's release, their publisher THQ went bankrupt and the studio didn't manage to find a new buyer. However, the Darksiders IP was picked up by THQ Nordic (formerly Nordic Games), and many of the staff from Vigil would go on to form Gunfire Games, the developers of Darksiders 3. After so much turmoil, it is not terribly surprising that the long-awaited third chapter in the series feels quite different from the first two games, but unfortunately, almost none of the changes are positive. After playing as War and Death in the previous Darksiders games, the third title sees you filling the shoes of the only female horseman, Fury. While War was in chains and Death was on his quest to restore humanity after the apocalypse began on earth, we learn that the Charred Council sent Fury on her own quest, to defeat the Seven Deadly Sins that were unleashed during the same event. 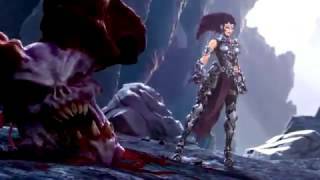 In the Darksiders universe, the Sins are manifested as various beings which Fury must defeat in combat, with the story taking her to Earth to track them down one by one. If there is one aspect of the game that holds up to the previous entries, it is the story, which proves to be fun and well presented, with good voice acting bringing life to the somewhat goofy but engaging dialogue between new and returning characters. Fury's constant anger can make her feel a bit one-dimensional early on, but she does eventually grow as a character amid some interesting narrative twists and turns that keep things interesting and help the game's sub-story fit comfortably into the unique and intriguing, but convoluted, overarching plot for the series. While the quality and content of Darksiders 3's story and character interactions fit pretty nicely alongside previous entries, the rest of the experience is significantly less successful. From a gameplay standpoint, the series has always borrowed ideas from other games, such as God of War, Legend of Zelda or even Portal. The first two titles executed their combination of hack-and-slash action, platforming and puzzles so well that it was hard to care too much about the lack of original mechanics, especially in light of the unique premise and setting. Darksiders 3 continues this trend of borrowing ideas, with one series in particular seemingly having served as a muse for the developers: Dark Souls. 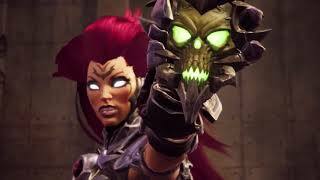 Darksiders 3 funnels you into a boss fight within minutes of starting the game, a trick long utilized by the Souls series as a means of saying “this is what you can expect, we aren't messing around here!” Unfortunately, Gunfire Games didn't quite get the memo that the Souls' series and its successful imitators abide by: the game should to be difficult, but also fair. 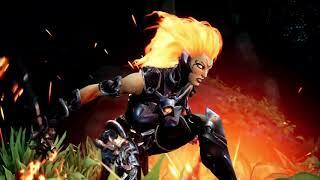 The opening boss fight in Darksiders 3 has you not only learning the basics of combat, but also platforming, forcing you to complete a sequence of moves while the boss charges an attack that you can interrupt only by completing a platforming sequence, with failure resulting in the attack hitting you no matter what and depleting most of your health bar. The platforming controls in Darksiders 3 aren't particularly precise, with Fury sometimes not grabbing onto ledges and instead just awkwardly bumping into them and falling, or trying to perform an aerial attack instead of using her chain whip to grapple onto a pipe and swing; shortcomings that are made glaringly obvious in the opening minutes of the game. When you inevitably fail this sequence, the game doesn't put you back at the start of the fight, but rather back at the very beginning of the game; only a couple of minutes away from the boss, but still a perplexing choice and a deflating moment for the player. This might be the worst and most frustrating start to a game I've ever encountered. The fight isn't particularly difficult once you get a handle on the controls, but trying to learn the mechanics under these circumstances is a really poor experience and left a bad taste in my mouth going forward, though it did help me share in the blistering emotions of the game's protagonist Fury. This opening boss fight proves to be indicative of the kind of sloppy design that permeates the entire experience, though fortunately, things do improve afterwards. The general structure of the campaign should be instantly familiar to anyone who has played a game in the Souls series or one of the many titles that borrow its core design ideas. When you kill enemies, you gain experience in the form of souls (in fairness, the original Darksiders games also used souls as a form of experience). If you die, the souls are dropped, enemies respawn and to get the souls back you must return to the location where you perished. The bonfire equivalent here are portals where a demon appears, who will take the souls and provide attribute points to level up your character, while also doubling as a vendor. There are only three attributes you can put points into; health, strength which increases physical damage, and arcane which improves special attacks. As a result, character progression feels pretty simplistic. Darksiders 3 waters down the Souls formula by allowing souls you drop when you die to remain on the map across multiple deaths, and by making a large portion of the souls you receive tied to usable items which you do not drop on death. This removes most of the tension that makes this system interesting in other games. The main implication of the Souls-like design is that checkpoints are now less frequent and you'll need to replay the same sections repeatedly. The action is also selective in how it emulates the Souls games; enemies hit hard, and Fury goes down extremely fast when fighting, even on the lower difficulty levels. Many enemies will block incoming attacks, forcing you to learn their patterns and wait for an opening to do damage. However, the hack-and-slash style combat with combos and specials from the first two games is still here as well. The combat feels responsive and Fury has some fun, flashy attacks, with the lack of a stamina bar giving the action a much faster and more sustained feel than your typical Souls game. You build up different meters for special attacks that let you feel incredibly powerful for a short time. It is easy to switch between different weapons mid-combat, giving you quick access to different options depending on the situation. The loot system from Darksiders 2 has been replaced with a set progression of weapon unlocks that are tied to progress in the story. Each weapon feels unique and has its own combos, and can be upgraded individually with individual enhancements, but most combat encounters don't give you a chance to use more than the basic attacks. There is actually a pretty good variety of enemies in the game, but I felt like I never really had to change up my tactics. The game likes to throw groups of enemies at you, and the only viable way to survive is to dodge frequently and get in a few hits and counter-attacks here and there; the longer, flashier combos just aren't viable for the most part. The camera and lock-on system also struggle when you are dealing with multiple enemies, pointing in unhelpful directions, getting blocked by terrain, and almost always locking on to some random enemy half way across the room instead of the one actively stabbing you. The Dark Souls-style healing feels out of place in such a fast-paced combat system; you need to stop and use an item which takes a few seconds, and finding time to do this while surrounded can be a challenge. Other items you find that might give you a temporary increase in durability or damage must be used in the same way, and it breaks up the flow of combat. The combat system does have a chance to shine when fighting individual tough enemies and during the generally well executed boss fights. If you evade an attack with perfect timing, you are treated to a slow-motion dodge and the opportunity for a special counter-attack which both looks cool and feels good. These moments tend to get lost in the more chaotic fights against groups. The boss encounters with the Seven Deadly Sins are the clear highlights of the game, with much of the story unfolding around them, and fun interpretations of what the Sins might look like if manifested as some sort of anthropomorphic being. The frustrating platforming of the opening fight is thankfully absent from the rest, who instead encourage the player to learn the attack patterns across multiple phases. One fight in particular feels a bit too similar to a seminal Dark Souls battle, while another drags on for too long, but in general, this aspect of the game is well executed. Puzzles also return and serve to break up the action, but they feel stripped down and overly simplistic compared to the first two games. The puzzles fare a bit better than the clumsy platforming as a means of breaking up the action, with some interesting mechanics that at least behave consistently, and though the puzzles are generally pretty straightforward, they allow for some moments of satisfaction when you figure out a trick to make it past a seemingly dead end. The lack of a map and sometimes unwieldy compass used for guiding the player can lead to moments where it is not clear if you are meant to be solving a nearby puzzle or are simply going the wrong way. After Darksiders 2 took players to some really imaginative locations, returning to a post-apocalyptic Earth in the third game feels like a bit of a letdown. Most of the game takes place in drab, overgrown urban environments, with a couple of more visually interesting levels here and there. There is a bit of room for exploration and a few secrets to discover, which is encouraged with glowing Dark Souls-style items hiding in every corner, typically with some kind of ambush being triggered once you pick them up. The series has never been known for technically impressive visuals, and the same holds true here, with generally muddy textures and flat lighting doing little to improve the artistically uninspired levels on the base PS4 model. To make matters worse, the game suffers from major performance issues on the base PS4, with frequent and severe frame rate drops and stuttering making the game borderline unplayable at times. The audio design is good, with meaty sound effects during combat and horrific shrieks coming from certain enemies. The original soundtrack only comes in during dramatic moments such as boss fights; an orchestral score that works well enough but doesn't make a strong impression. Unfortunately, jarring audio stuttering occurs when the game loads new areas in the background and I even had the audio cut out entirely a couple of times, forcing a restart of the game. In its current state, the PS4 version of Darksiders 3 is too littered with technical issues. Though Darksiders 3 does continue the story of the series while introducing a fun new sub-plot for the new protagonist Fury, it feels like letdown after such a long wait. The increased difficulty and awkward use of Dark Souls mechanics clashes with the fast, loose combat, while the puzzles are overly simplistic, the platforming is clumsy and the locations dull, not to mention the performance problems. Though there is a decent combat system hidden somewhere in Darksiders 3, Fury's fragility as well as issues with the camera and lock-on system go a long way towards ruining much of the fun. The mix of gameplay elements does keep the adventure moving along at a good pace, but unless you are dying to get another chapter in the Darksiders storyline, or desperate for a Dark Souls-lite action game, I would struggle to recommend this long-awaited sequel. Most of the locations are both technically and artistically drab, though voice acting and character designs are pretty good, and the audio and soundtrack are solid when they work properly. The fast paced hack-and-slash style combat feels responsive and satisfying but is at odds with Fury's fragility and the Souls-style healing and item usage. Platforming has control issues, while puzzles have interesting mechanics but are overly simple. A fun and largely well paced story punctuated by some memorable boss fights against the Seven Deadly Sins that should take between 12-20 hours depending on the difficulty level and how much time you spend exploring. Darksiders 3 runs terribly on the base PS4, with severe and frequent stuttering and frame rate drops in many areas, and issues with audio stuttering and even cutting out entirely.